(Newser) – Lin Ming-wei says he owes his life, and that of his family, to a last-minute decision to switch seats aboard the TransAsia plane that crashed yesterday in Taipei, killing at least 31 people. Just before takeoff, Lin says he heard an odd noise that unsettled him, and he asked for permission to move with his wife and 2-year-old son from the left side of the plane to an empty row of seats on the rear right side, CNN reports. 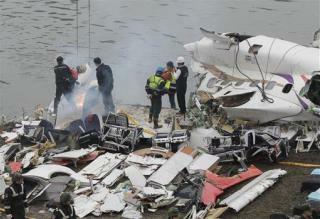 Minutes later, Lin found himself in the plane's wreckage in Keelung River; the family's new seats were next to where the fuselage broke up, allowing him to exit via the opening, Focus Taiwan reports. He escaped unscathed; of 15 survivors, he was the only one who didn't need medical attention. Good, job, Dad. Way to be. Trust you intuition. Whether you call it God, or third eye, or tapping into the universe, or whatever, it can save your life.